i once lived at 18 Park Terrace for 8 months way back in 1999-2000. Those 8 months were punctuated with a precarious balance between serious studying and serious binge drinking. i was an exchange student from Canada, my very first time outside North America, and on a mission to impress the locals. 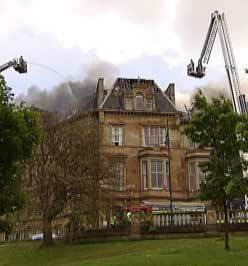 18 Park Terrace was a beautiful building and i guess Glasgow University thought so too and sold it a few years back. Apparently they were to be turned into some posh townhouses or something. Weird because i remember it being industrial and smelly with student body odours. One week ago, after work, i was walking to a pub to meet a friend for a drink. The entire west end was stinking from smoke and i asked my friend what was burning. 18 Park Terrace was the reply. R.I.P. 18 Park Terrace - a colourful moment from my drunk and youthful education.